Almost any container will do. The Worm Friendly Habitat, however is very handy and has everything you need to make compost with your worms. 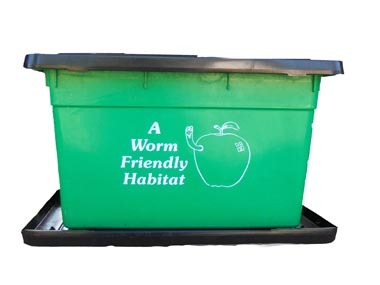 "Worm Friendly Habitat": This simple, easy to set up and maintain worm composting bin is atractive and... well... "worm friendly". Deminsions are 22.5"L x 17.5"W x 12.5" H; 14 Gallon; Weight 6#. It's an attractive green with a black snap-on lid. It has built in handles for easy carrying and candy-apple styled air vents in the sides, top, and bottom. Legs keep the bin off the tray, which catches any excess water that can drain out of holes in the bottom of the bin. Click here for economical vermicomposting bins you can make yourself. No part of this website, it's content or images, may be used without authorization.